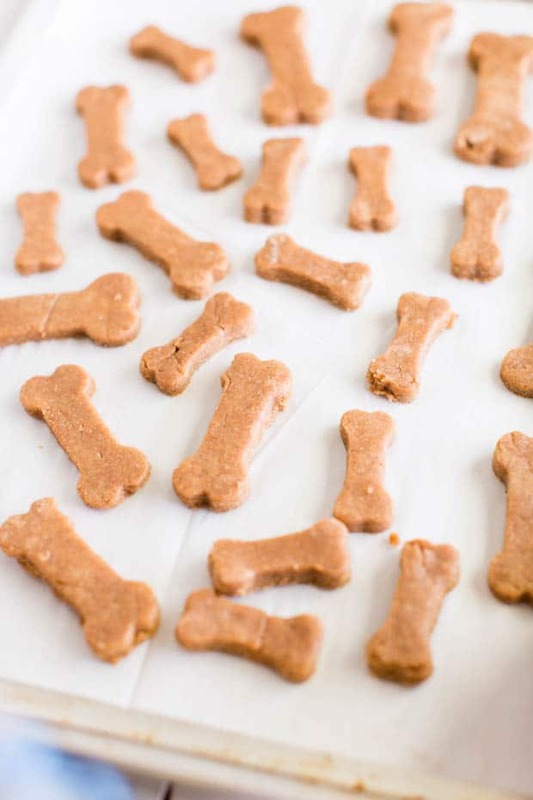 These easy, healthy Homemade Dog Treats are a special recipe to serve your favorite pet! 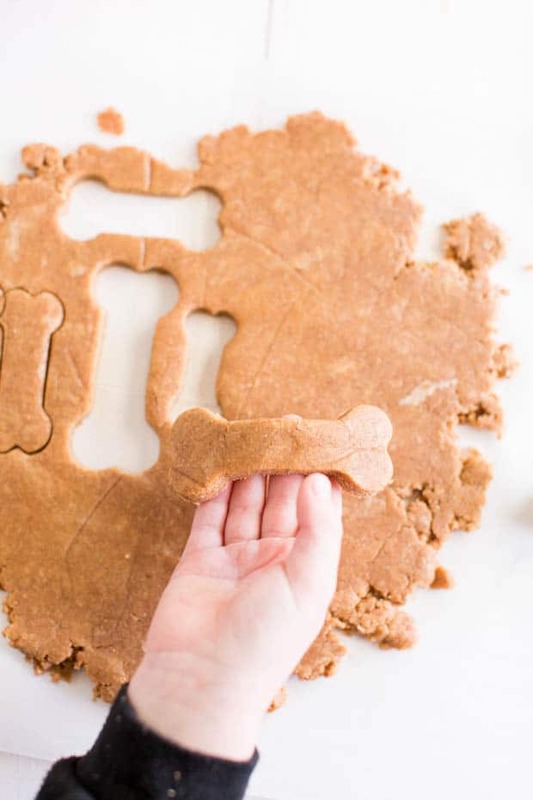 Homemade dog treats are a simple way to let your little puppy know they’re loved. 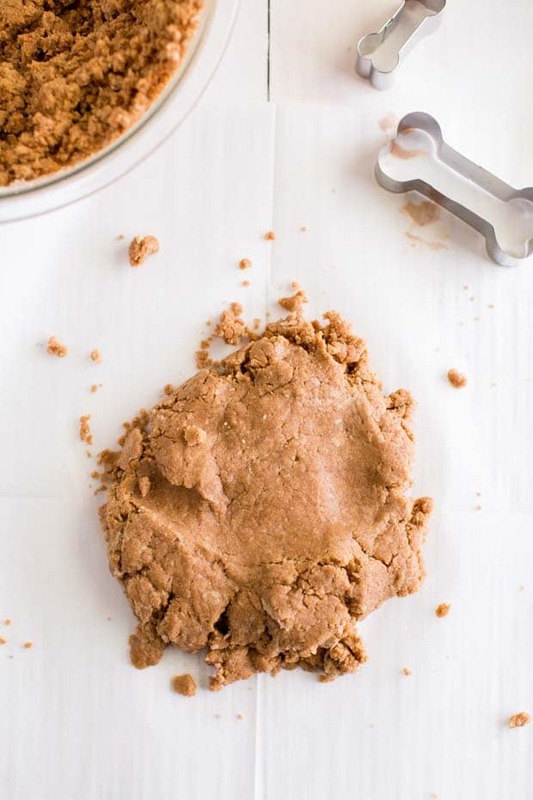 This easy, healthy homemade dog treats recipe is the best. They are so simple to make homemade and deliver great flavor even for dogs with sensitive stomachs or allergies. We use a cookie cutter to get the cute shape. 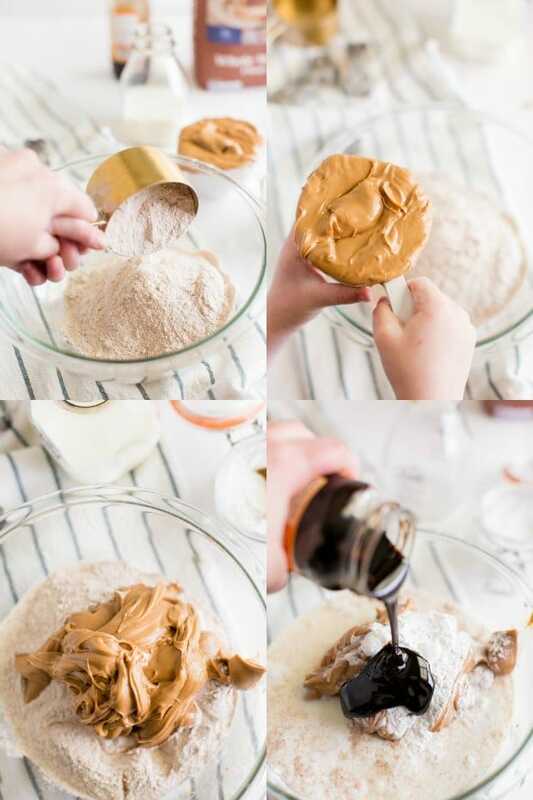 We use peanut butter, but there are lots of variations you could try. These include pumpkin, banana, sweet potato or baby food — there are lots of options. 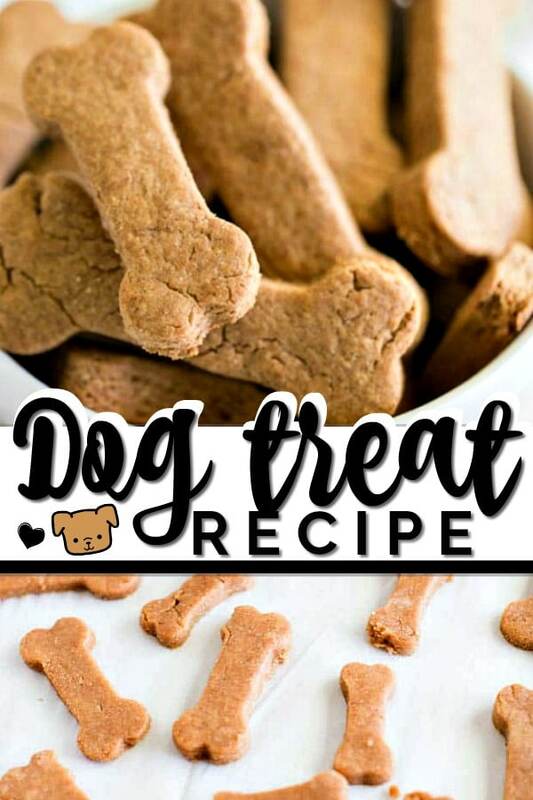 You’ll make your own homemade dog treats from now on once you try this simple recipe… enjoy! 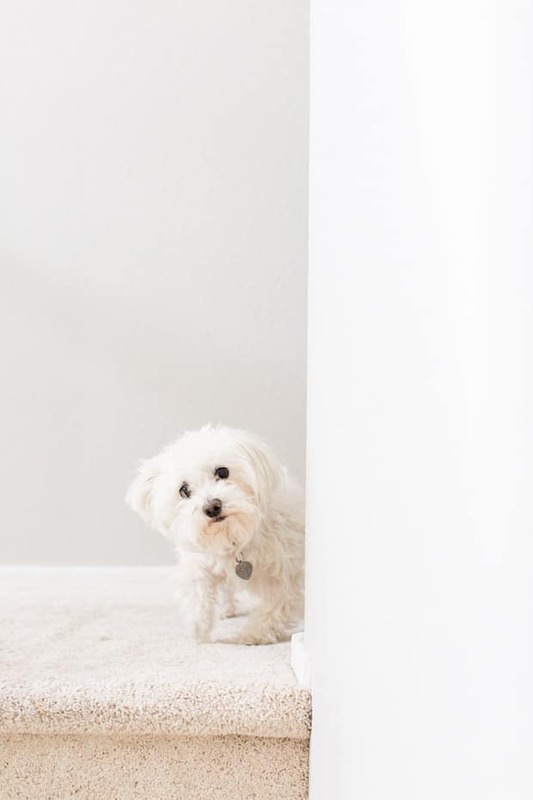 Before we get to the recipe, I want you to meet Max. This little cutie patootie belongs to my sister. He’s stolen my heart too, if I’m honest. 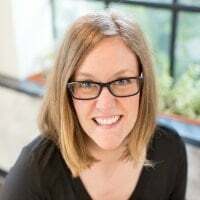 My sister is expecting her first (human) baby right now. Little Max is definitely sensing the changes in the family dynamic. It’s amazing how in tune with emotions pets can be. I figured a little extra dose of attention might help Max as they prepare for the soon to be arrival of baby. 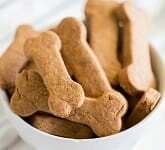 This homemade dog biscuit recipe is so easy to put together. Rowen helped me in the kitchen — something we both love. Let me tell you: kiddo help in the kitchen is a great time to bond and I love that my boys can learn valuable life skills while we’re at it. Plus, Rowen loves to show off his muscles with all the measuring and mixing. 😉 He did a great job rolling out the dough and helping me with the cookie cutter. This simple recipe has only five ingredients. FIVE. It’s that simple. First up, you’ll want to preheat your oven to 350 degrees. Then, combine the ingredients in a mixer on low until well blended. Or borrow your son’s muscles. In my experience, boy’s love proving how big their muscles are and showcasing what they can accomplish. Once well mixed, put the dough between two sheets of parchment paper and roll to approximately 1/4 inch in thickness. We used a darling bone shaped cookie cutter for our puppy treats. You could also use a traditional circle cookie cutter or a glass. Once we had the bone shapes, we popped them onto a cookie sheet for baking in the oven. You’ll bake for approximately 17 minutes. You’ll get about 40 medium sized dog cookies from this recipe. Now that you’ve learned how to make your own dog treats, how do you store them? I stored Max’s in an airtight container in the fridge. They can last for up to two months in the fridge or up to eight months in the freezer. While Max was noshing on his dog cookies, my sister and I did some chatting. I’m so excited watching her get ready for the birth of her daughter. You see, as my sister and I talked about preparations, hospital bags and freezer meals, I asked what else she’s doing to help get Max ready for baby. One of the things on her list is making sure that Max is protected from fleas and ticks. Naturally, she doesn’t want Max to have to deal with them or have them around the baby! Fleas and ticks can be present year round, not just in warm weather. They can also lay dormant for several months before hatching. Um… ewww. 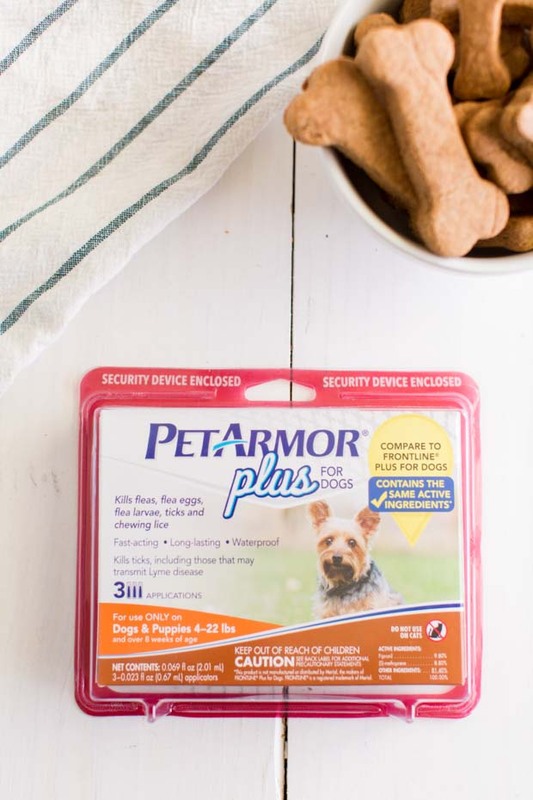 PetArmor Plus is a topical protection you apply to your pet. You can find it at Walmart and Walmart.com, making it a convenient and affordable option. It’s a fast acting, waterproof formula that is available in four different weight brackets. They also have a formula for cats. 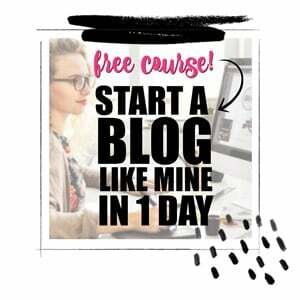 You can grab it while getting ingredients for your homemade dog biscuits! 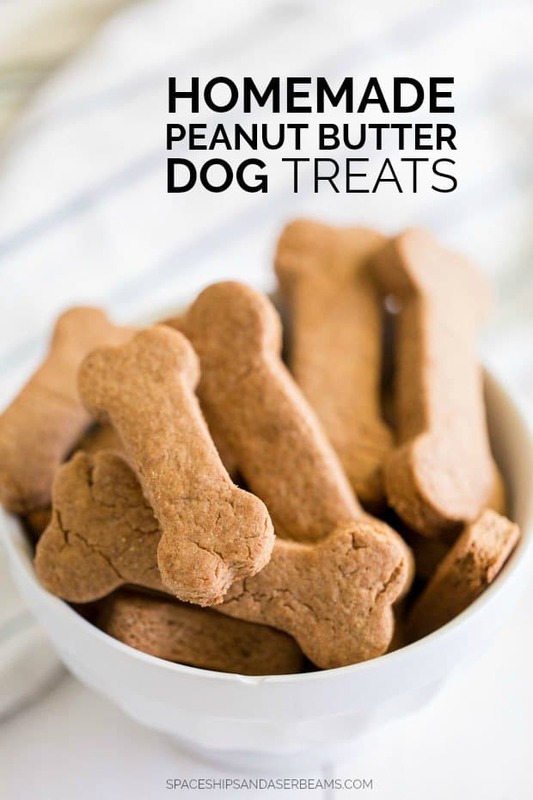 Show your pet you care with these homemade peanut butter dog treats and PetArmor soon! Plus, check out How to Make Apple Carrot Dog Biscuits! Combine ingredients in mixer on low until well blended. Put dough between two sheets parchment paper. Roll to approximately 1/4 inch in thickness. Use cookie cutter (or glass) to cut out biscuits. 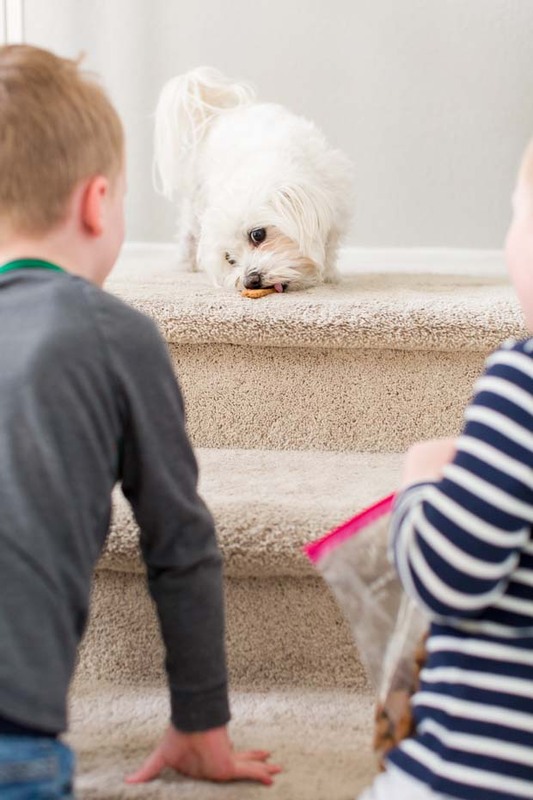 These dog treats are a hit with my puppies! They like them way better than the store bought treats! It is indeed convenient and affordable option. My dog loves it very much! Can I use regular flour instead of wheat? I also use regular flour. Sometimes I use crunchy peanut butter because they love peanuts. Some say they shouldn’t have them but wondering why not. My dogs have never had a problem with them. These are so easy to make and our dogs LOVE them. They have never liked store bought dog biscuits however these are a hit!! I made these today. Fun’s and easy. Thank you for sharing. Did you attempt it with sweet potato yet? Can you use plain flour? Do you r can you leave the peanut butter out. Wondering if I can substitute pumpkin for the peanut butter?? Or if anyone has a recepie for treats that uses pumpkin?? Diana I use 1 cup pumpkin puree instead of the milk. My 12 furry kids love them! I also tried the pumpkin . Love it . Thanks for the suggestion , we are a dairy free home ! You can store them in an airtight container in the fridge. They can last for up to two months in the fridge or up to eight months in the freezer. Would almond flour work? Dog on grain free diet. It might but I don’t know for sure because I haven’t tried it. I also know that almond flour can be a little more dry, so it could change the texture and you might need to adjust other ingredients accordingly. Good luck! Hi, Tammy – if you scroll to the bottom of the post, there is a printable recipe card with measurements. Thanks! Hello, I just ran across this recipe and I am going to give it a try. My 4 fur babies aren’t crazy about bought dog biscuits. Can you use self rising flour?